The best part of these little tarts are made with all natural ingredients and packed with healthy fats from the walnuts, almonds, avocado…! They’re raw, vegan, gluten-free and creamy rich without being over the top sweet. Avocados helps to regulate the Blood pressure. Good source of fiber and they are even good for your skin. Line 3-4 muffin pans/ramekins with plastic wrap and set aside. Combine almonds, walnuts to a food processor and grind on high until finely chopped. Add in the dates, sunflower butter/spread and process until mixed in. Divide the mixture between 3-4 greased pans/ramekins pressing down firmly with spoon till flat, set aside. Split the avocado in half, discard pit, scoop out flesh and add to the food processor bowl with dates, vanilla extract, lime juice and process high until smooth, scraping sides as needed. Mix in sunflower spread/butter and process again on high until mixed. Divide avocado cream between the cake pans/ramekins smoothing top. Gently cover each pan with a small sheet of plastic wrap and refrigerate until set about 6 hours or freeze for an hour to speed it up. To plate, pull out of the pans by the plastic wrap, flip over carefully and place the avocado cream facing top. Adding dates to Avacado cream resulted in reduced greenish colour. Alternatively Sugar can be added to retain the green colour of Avocado. I used small ramekins, however these were absolutely adorable in mini ramekins and you could make one large tart instead. Just make sure the Ramekins/Tarts are pretty frozen when you go to get them out of the tin or else you’ll mess them up. Avocado oxidizes very fast so adding lemon juice immediately prevents it. Posted on December 6, 2014, in Dessert, Indian, International, Sweets, Vegan and tagged desserts in 15 minutes, Healthy dessert recipes, Vegan desserts; Gulten free dessert;drchdietfood; chitras healthy kitchen. Bookmark the permalink. 20 Comments. Great AND no bake too!! Oh my goodness… what a lovely little cake! Thank you so much for bringing it to Fiesta Friday! You can’t beat a healthy cake that’s yummy and also doesn’t need baking, you definitely knocked it out of the park with this one Chitra! This sounds like a wonderful and healthy dessert! 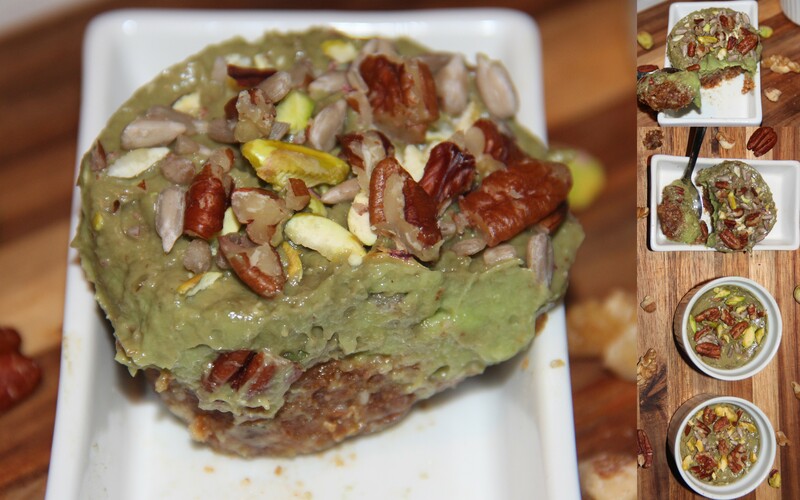 Thank you so much for sharing it at Healthy Vegan Fridays =) I have pinned your recipe on our Pinterest Board.